The prickly shark (Oxynotus bruniensis) has skin that is more sharp and spiky to the touch than the sandpaper-like roughness of other sharks. Rather than a swim bladder, sharks have oily livers – the light oil helps them to be neutrally buoyant, reducing the need to swim constantly to avoid sinking. 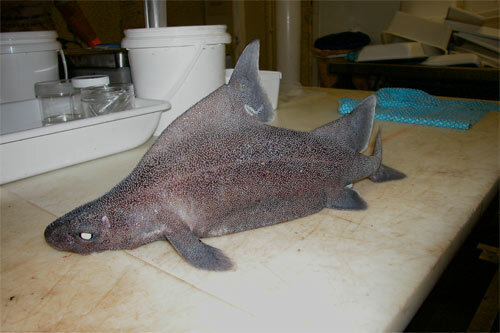 The prickly shark’s oily liver is particularly large because energy savings are more important at greater depths where food and oxygen are scarce. It is found between 100 and 800 metres below the surface.